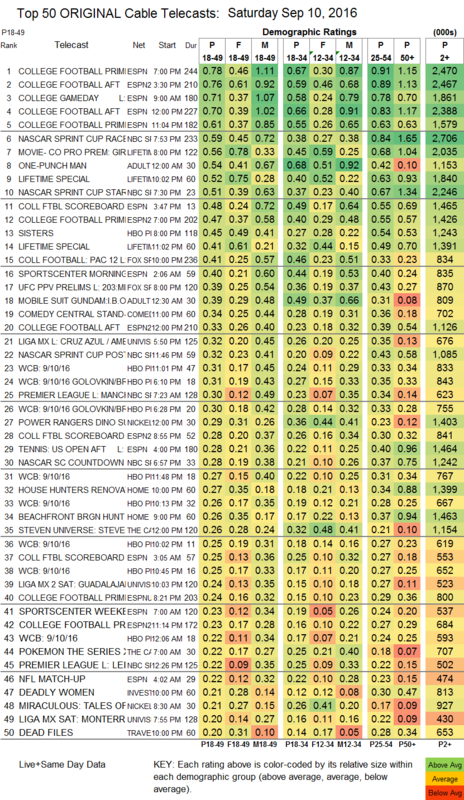 NETWORK FINALS: ABC’s COLLEGE FOOTBALL game remained at 1.9 in final numbers, while FOX’s stayed at 0.5. Elsewhere, the final hour of AQUARIUS gained 0.1 to a still-dismal 0.3. CABLE HIGHLIGHTS: As will mostly be the case every Saturday until the end of the year, COLLEGE FOOTBALL owned cable, with games or related programming in all of the Top 5 slots, the lead being a close battle between ESPN’s Arkansas vs TCU game at 0.78, and ESPN2’s Alabama vs. Western Kentucky game at 0.76. NBC Sports Net scored 0.59 for a NASCAR race. Lifetime’s movie GIRL IN A BOX was robust at 0.56, and follow-up specials were at 0.52 and 0.41. On Adult Swim, the full line-up returned after taking Labor Day Weekend off, with DRAGON BALL Z at 0.58/1.249M, ONE PUNCH MAN at 0.54, MOBILE SUIT GUNDAM at 0.39, HUNTER X HUNTER at 0.35/738K, NARUTO at 0.31/692K, ONE PIECE at 0.29/635K, and PARASYTE at 0.24/550K. HBO reports its BOXING ratings in segments, which were 0.31/0.31/0.30/0.27/0.26/0.25/0.25/0.22/0.18. HGTV’s HOUSE HUNTERS RENOVATION was at 0.27, with BEACHFRONT BARGAIN HUNT at 0.26.